As almost every one knows about the input and output devices of a computer system, but here i’m compare both of them and tell you briefly about the main difference between them. Simply all input devices are used to sending information to the computer system for some kind of processing on it and output devices are those which displays the results of these inputs. Many devices are behaves like both of input and output or simply say that I/O devices. 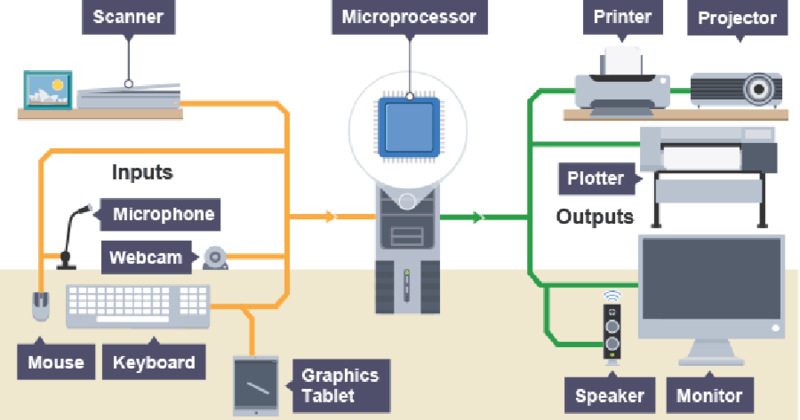 As in this example see that, some input devices like Scanner, Keyboard, Mouse, Microphone, Webcam are use to inputting some information to the microprocessor and then microprocessor takes some processing on these inputs and then display the results in the form of output. Output devices like Printer, Projector, Speaker, Monitor are used to display the results of inputs. Input Devices are those devices whose can sending data to the other input or output devices. Input devices only input data, they cannot receive any kind of data from any other device. There are many examples of input devices like Keyboard, Mouse, Touchpad, Pen Input, Microphone, Electronic Whiteboard, OCR, OMR, Punch Card Reader, Magnetic Tape Drive, Webcam, Scanner, MIDI Keyboard, Gamepad, Joystick, Barcode Reader, Digital Camera, Cameras, Graphical Tablets, these are used to inputting your data to the processor for processing. These devices cannot receive any kind of information from the other computer. Output Devices are those devices whose can only receiving data from other devices. Output devices only receive data or information, they cannot input any data to other computer. There are many examples of output devices like Monitor, Speaker, LCD, LED, CRT, Printers, Plotters, LCD Projection Panels, Microfiche, Film Recorder, Visual Display Unit, Speakers, Projector, these devices are used for outputting or showing results. When we given anything to the microprocessor for some processing of it, it is in the form of “Data“. When processor , processing on it, this inputted data will be converted into “Information“. Information or output can be categories into two form, when data show to the Monitor or LCD, it is known as “Soft Copy”, and when we use “Printer” and print this output, then the information is known as “Hard Copy”. These are some important input and output devices of a computer system, but there are also many others which you find on the internet. If you’ve any question and want to share your thoughts, then feel free to comment below and share this post with others.